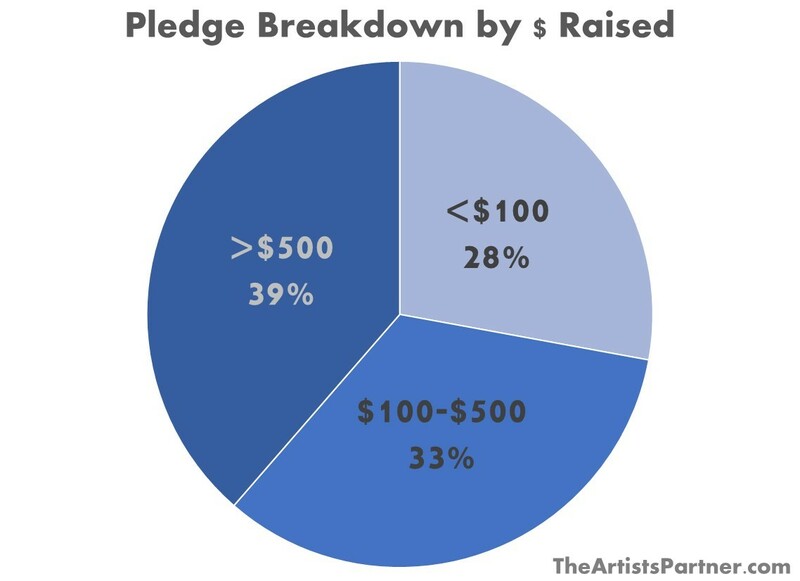 Your crowdfunding campaign is a great way to kick off your project’s “brand.” One of the reasons our clients’ campaigns succeed 97% of the time, compared to the industry average of 38%, is that they have a cohesive look that can be sustained throughout the life of their creative work. 1. Iconic image. 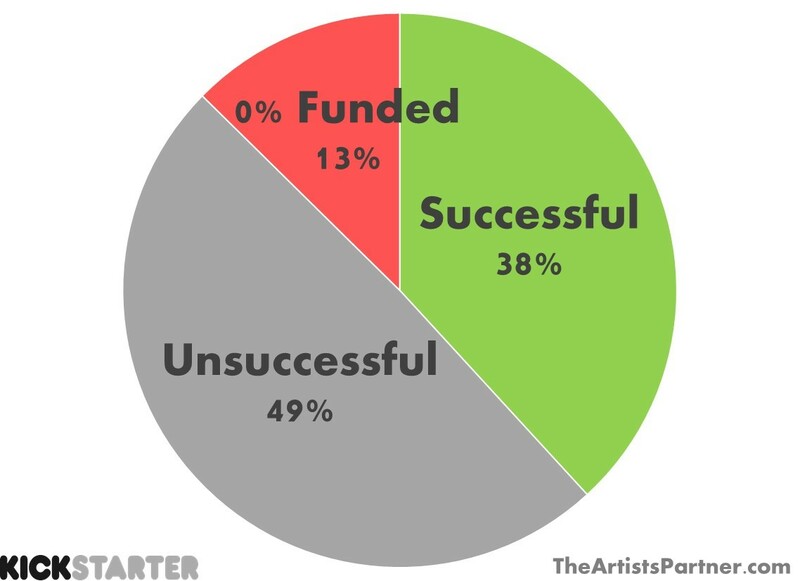 Your project will need one key image that sums it up. Sometimes our clients hope to wait until after their campaign is finished to have the funds to pay a designer, but it is difficult for a project to be memorable without a representative image. Many of our clients know some basic image software – or someone who does. A good first draft by a talented friend is infinitely better than no image at all. The example below is the “before” and “after” covers from the illustrated novel GroomsDay by Jenny Edmondson. Sometimes, the iconic image for the project goes through multiple iterations. All three of the versions below were used at some point before, during, or after the campaign for Sonya Heller’s Americana album 17 West. We discussed the elements of the album cover at length, months ahead of the campaign launch, and then, using free photo editing software, we came up with a draft. When the campaign successfully funded, Sonya paid a professional designer to create an eye-catching album cover. 2. Color palette. This is closely related to your iconic image – once you have one, coordinate your campaign visuals with it. 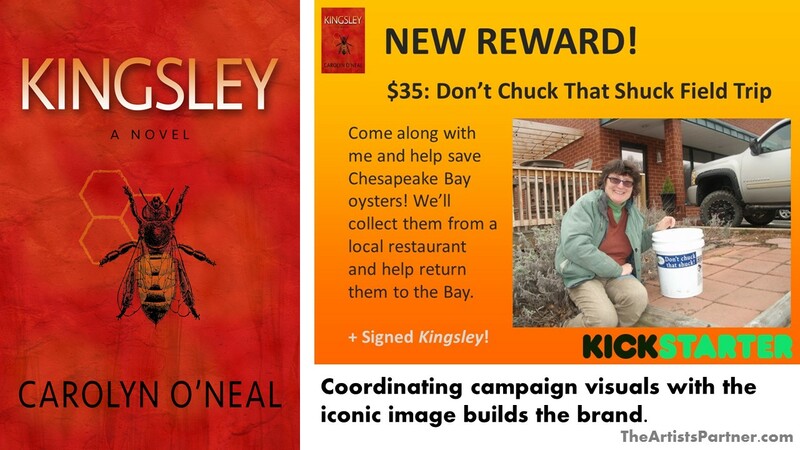 This is a great example of a featured reward for eco-thriller Kingsley, using the vibrant color scheme from the book cover. 3. Profile picture. You don’t necessarily need professional head shots. You do need at least one great photo of yourself that fits your project. People respond to faces. Below is an excellent example of Shaun Farris from RED’s Custom Jewelry. This is a candid photo taken while Shaun was doing what he does – make jewelry. 6. Layout. It’s so easy for a campaign to look boring or messy. The best way to explain an enticing layout is to have a look at one. Take a look at the great campaign for the children’s picture book Princesses Only Wear Putta Puttas by Priya Mahadevan. The sections are clear, the colors complement one another, the headers pop – and Priya immediately begins with her wonderful message. 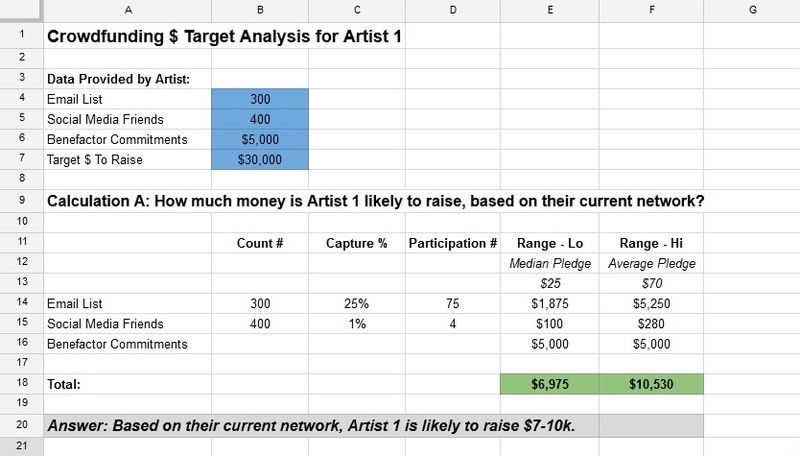 For a free analysis of your crowdfunding project, please fill out our Artist Questionnaire. We typically respond within two weeks. We look forward to hearing about your project! One of the reasons our clients succeed 97% of the time – compared to the 38% industry average – is that we’re strategic about campaign dates. Timing is everything! So, why not just hit “launch” as soon as the campaign is built, and then run it as long as possible? There are so many reasons. Lead time for VIP buy-in. We pick a launch date at least three months away so there is time to get your Day 1 Backers, Influencers, and Benefactors (follow the links for more about these VIPs) on board. Most people need to hear something 7 times to remember and understand it, so we need time to get your VIPs ready and excited for launch. Avoiding holidays. Summer, Christmas, Passover, New Year’s, and Easter are terrible times to try to hold the average person’s attention. Don’t fight it. As a general rule, May and October are the best months to run a campaign because they aren’t interrupted by major holidays. Optimum length. 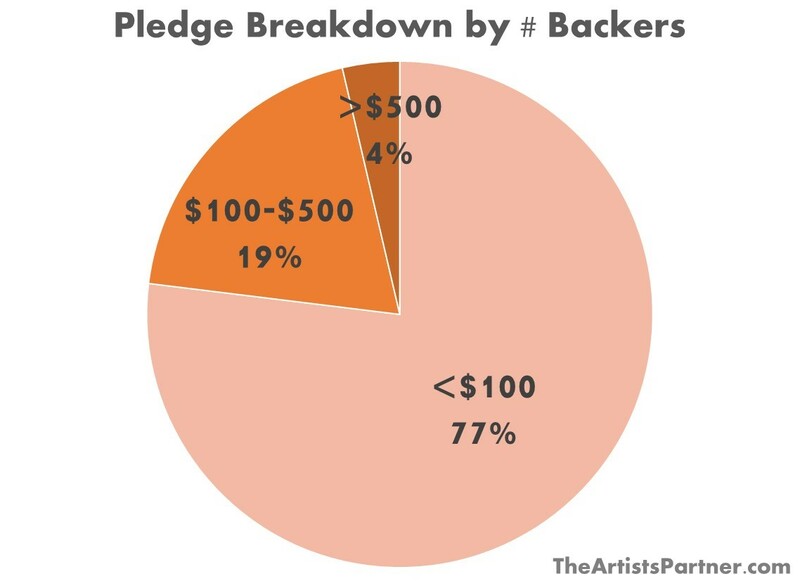 Kickstarter ran the numbers, and 30 days is just about right. 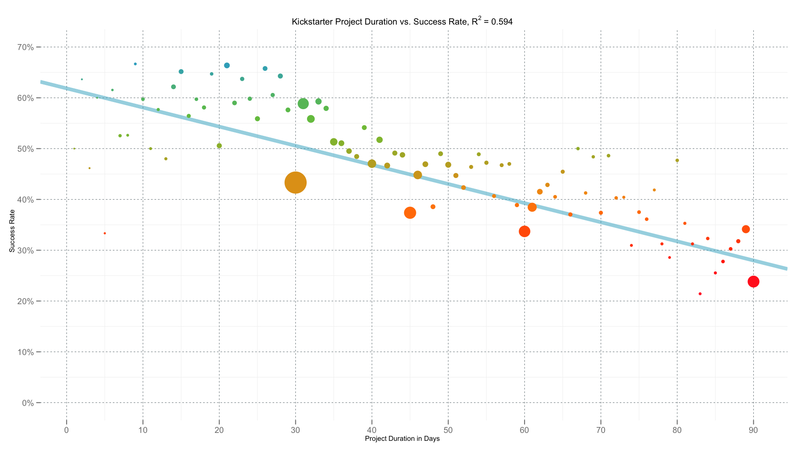 Many people think a longer campaign will be more successful, but it won’t be. It will run out of steam. Click the image below for the full data rundown. The magic of T/W/Th. Tuesday, Wednesday, and Thursday are the days of the week that are easiest to get and hold someone’s attention. We often launch on a Tuesday and close on a Thursday to maximize the momentum on the all important first and last days. Project launch date. 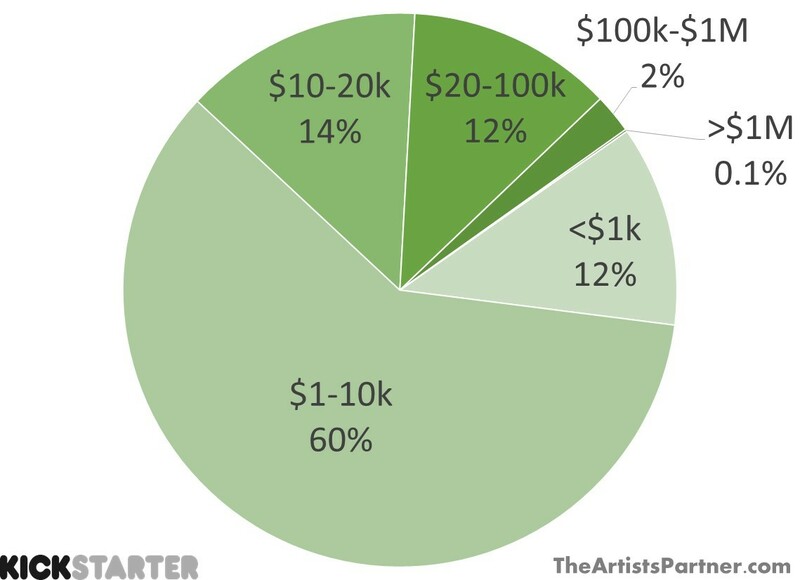 A crowdfunding campaign is excellent marketing for the eventual launch of your project. The nature of the perfect timing varies, but we like to time the campaign so it’s also setting up the marketing momentum for your project. Key date tie-in. Doing an environmental-themed project? Run the campaign in April to hit Earth Day. Or is your project about Halloween? Run it in October. Anytime we can catch an awareness tailwind, it helps the campaign. 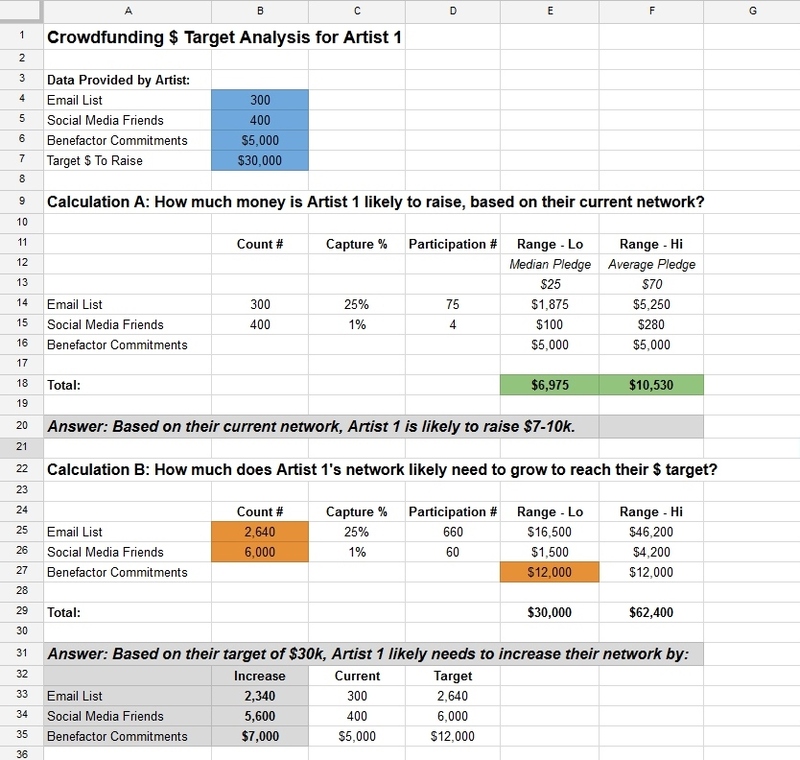 For a free analysis of your crowdfunding plans, please fill out our Artist Questionnaire. We typically respond within 2 weeks. We look forward to hearing about your project!